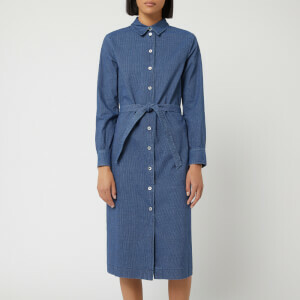 Women’s indigo shirt dress from A.P.C. in flowing Italian viscose with a textured jacquard finish. Cut for a slightly flared silhouette, the ‘Kimya’ shirt dress is designed with a narrow officer collar and a button placket that reaches the waist. The dress gathers around the waist with flat pleats to the front and back of the skirt. The shirt dress features long sleeves with wide cuffs and four buttons. Complete with a back yoke, a topstitched ‘X’ on the bottom of the placket and iridescent mother of pearl buttons.